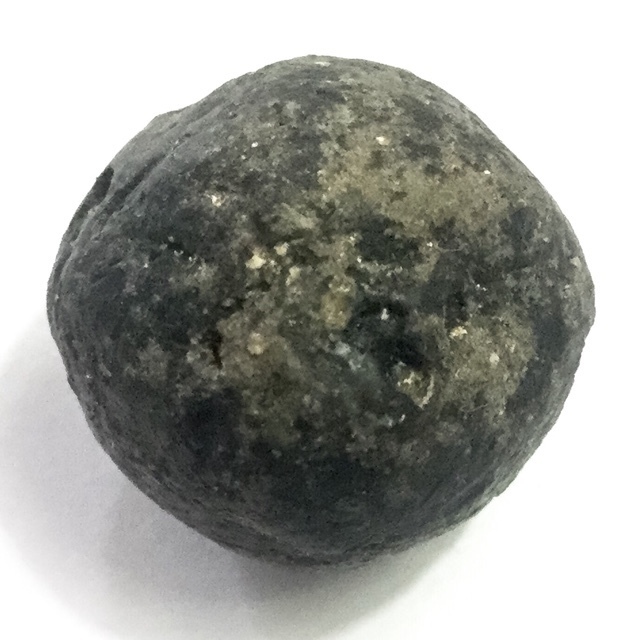 An extremely rare ancient sacred powder ball amulet for protection and wish fulfilment from the Grand Master Upachaya Luang Por Him, Olden Days Abbot of World Famous Wat Bang Pra Temple in Nakorn Chaisri and Kroo Ba Ajarn in Wicha Sak Yant to the Great Luang Por Phern Tidakuno (Wat Bang Pra). Luang Por Him was the Abbot of Wat Bang Pra temple before the coming of the Great Sak Yant Master Luang Por Phern Tidakuno, who is himself considered the most internationally famous Sak Yant Thai Temple Tattoos Master of all time. Luang Por Him was the Mentor and teacher in Wicha Sak Yant, of Luang Por Phern, and was the number one Sak Yant Master of his Time by far and above. The Look Om is estimated to have been made somewhere around the year 2470 BE, and provides Klaew Klaad, Kong Grapan Chadtri, Maha Ud protective Magic, Sarapat Neuk Wish Fulfilment, and Maha Pokasap Maha Lap Metta Maha Niyom Power for Lucky Fortunes, Prosperity and Good Business. Luang Por Him Intachodto, was known for his not permitting loudness in the temple, and would scold people if they did not keep quiet. People would tiptoe past his Kuti and the old Uposatha shrine room to avoid being told off for disturbing the peace of the temple. The temple was a very peaceful place because of this. Luang Por Him would chant spells and blessings into Sai Sek (enchanted sand) and give it to the devotees to sprinkle around the temple grounds. This is believed to be one of the reasons why in those days, on the day of the yearly master day ceremony, there were never any fallouts or arguments on the temple grounds between the lay community. The blessings in the sand served to emit Metta Maha Niyom Mercy Charm, to soothe the heart and dissolve animosity. Luang Por Him would mostly make Pha Yant, and Suea Yant (Yantra Shirts) to empower and hand out to devotees. Many Police and Military would throng to the ceremonies to receive his Sacred Yantra shirts and cloths, and Krueang Rang Talismanic amulets. Luang Por HIm would throw the Yantra cloths and shirts into the fire, and only distribute those which would not burn, which is one of the methods of testing the power of the Yant. His Monk Coins are of extremely high rarity and value in the collector scene and with his devotees, for example his Rian Sema first edition coin from 2470 BE, which holds Master-Class Pra Niyom Status. Luang Por Him would always perform Sak Yant himself on his disciples, and was most famous for his Sak Yant Gao Yord, Yant Paed Tidt, Yant Ngop Nam Oy, and Yant Horm Chiang. The Yant Horm Chiang. The Yant Horm Chiang is said to have powerful Kong Grapan Chadtri which is tattooed, won't let a fly or mosquito bite you or come near you, and protect against sharp weapons. Luang Por Him learned his Wicha from an old Sorceror of the Late Ayuttaya Era, and Mastered a Great Many Wicha, including Sak Yant, Herbal Magic for Enchantments and Healing, with his Upachaya Mentor Luang Por Tong, of Wat Lamud, who was one of the most Powerful and Influential Master Monks of that time, and was also the Kroo Ba Ajarn of the Great Luang Phu Bun (Wat Klang Bang Gaew). Luang Por HIm himself for this reason also received the Wicha Metta Maha Niyom, and Wicha Ya Wasana Jinda Mani which is so famous from Luang Phu Bun, because it was Luang Por Tong, who passed on this Wicha to both Luang Phu Bun, and Luang Por Him. Before he passed away, Luang Por Him passed on all of his Wicha to his first disciple Luang Por Phern Tidakuno (Wat Bang Pra), who mastered them in there entirety. Luang Por HIm is said to have Mastered the Wicha Perd Loke (opening of the worlds), and attained high Abhinya Supernatural Powers. He was merciful towards animals, and would bring stranded animals into the temple for refuge, be it dogs, wild boars, gibbons.. He proclaimed that anybody who harmed the animals in the temple, would be cursed and die. One day a man came and stole a wild boar over 200 kilograms heavy from the temple tusks and all, but within a week the man was found to have died without any apparent cause or reason. After that, nobody ever dared to steal or harm and animal from the temple again. Luang Por Him was also very masterful with Samun Prai herbal Therapy to heal illnesses and ailments, and healed his devotees using herbal magic. Luang Por Him has a legend about a time when he sent some disciples to go bring some liquor to him. The disciple took the cup, and drank from it, and was astonished to see that Luang Por Him was speaking the truth, and that somehow he had transformed the liquor into a cup of harmless tea. This Look Om is a very Powerful Ancient Amulet for Protection and safety, Lucky Fortunes, Mercy Charm, and Prosperity. It is in addition an extremely rare item, that is hardly seen these days.